The: task: of: an: automatic filter is the trouble-free interception of all the impurities larger than specified for the main lubricating system. This is performed by the ACX filter better than any other equipment. But only the ACX filter can also supervise the engine behaviour. The frequency of the cleaning cycles is directly tied to the concentration of contaminants in the lube oil. When the engines is working at light loads, the concentration is higher than when it is heavily loaded, consequently the ACX cleaning cycles are more frequent. Only the ACX filter guarantees cleaning cycles constantly proportional to the workload. This unique feature enables the monitoring of the concentration of impurities, any sudden increase of which is a clear indication of impending failure (e.g of a mechanical component). By an alarm the ACX filter will warn the engineer of hazardous conditions, well in advance of any temperature related signal, allowing for a timely power reduction, possibly avoiding a crankshaft failure. No other filter on the market can match or even come close to the performances of ACX for reliability, life span, easiness in operation and maintenance. Since 1982 thousands of ACX filters have been installed worldwide. No external medium for cleaning (like compressed air). No recurring cleaning of the filtering element, and of course no special cleaning tools or liquids. No maintenance whatsoever. Since it does not use compressed air for backwash, ACX does not produces algaes or muds and it does not pollutes the lube oil with condensate or additives precipitations. No used cartridges to dispose of. The filter operates continuously, with an accurate filtration degree (from 10 μm absolute). 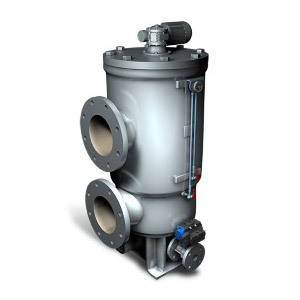 The filtering element is a stainless steel armoured unit capable of withstanding up to 10 bar (145 psi) differential pressure. The body is manufactured from EN-GJS400-15 cast-iron under a strict quality system, and has been approved by all major Classification Societies and Navies. An extraordinary feature of the ACX filter is that it can be used as a reliable monitor of the engine health and alert the operator about any mechanical failure in the system. See below how this unique feature of the ACX works.